Library of Congress photo, 1941. Fred Palumbo, World Telegraph staff photographer. I believe that I mentioned in a previous post that when you’re a kid an express an interest in poetry, people love to help exposing you to new poets. And I loved all of the recommendations. 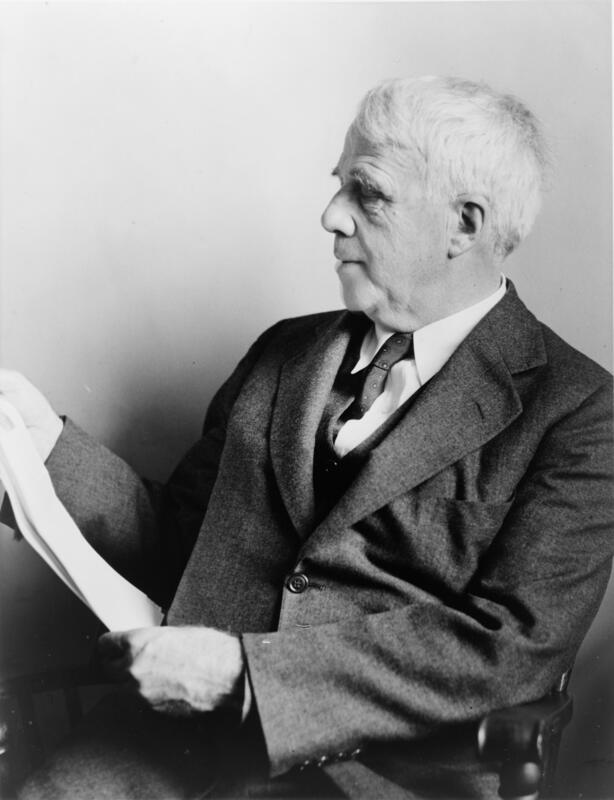 I don’t know how old I was when my father gave me a New England Anthology of Robert Frost’s Poems, but he gave it to me because he said that Robert Frost was one of his favorite poets. Today I took the book off my bookshelf and it really feels (and looks) like an older book, complete with a yellowing cover and pages; I must have received this in the early 90s and isn’t it wild to think of something from the early 90s as kinda old? His poems feel very New England to me (and perhaps that’s because the anthology that I own is a “New England Anthology”, but I was surprised to find out that he was born in California. He did, eventually, wind up in New England and one can visit the Robert Frost Farm in Derry, NH – something that I still need to do! So, anyway, that poems below will have a very New England-y feel to them, which I absolutely adore as I adore being from, and living in, New England. But never any more the dead. I have been treading on leaves all day until I am autumn-tired. God knows all the color and form of leaves I have trodden on and mired. Perhaps I have put forth too much strength and been too fierce from fear. I have safely trodden underfoot the leaves of another year. All summer long they were over head, more lifted up than I. To come to their final place in earth they had to pass me by. All summer long I thought I heard them threatening under their breath. And when they came it seemed with a will to carry me with them to death. They spoke to the fugitive in my heart as if it were leaf to leaf. They tapped at my eyelids and touched my lips with an invitation to grief. Now up my knee to keep on top of another year of snow. Buy Robert Frost on Amazon.